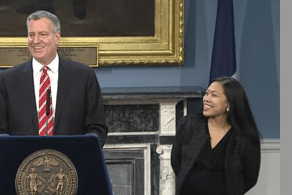 Mayor Bill de Blasio, who made criticism of the Bloomberg administration’s fining of small businesses a hallmark of his campaign, on Tuesday named a Bloomberg economic development aide to head the city’s Department of Small Business Services. In announcing Maria Torres-Springer, the mayor made it clear that their aim is to reduce fines, but the agency she will head has no control over the inspectors who have plagued merchants across the city. Ms. Torres-Springer, who was executive vice president and chief of staff at the city’s Economic Development Corp. under former EDC President and CEO Seth Pinsky, said she would work with other city agencies to reduce the amount fines and fees imposed on small businesses.